There was a time when there was much talk about Attention Deficit Hyperactivity Disorder (ADHD), also known asAttention Deficit Disorder (ADD). The prominent symptoms of this widespread behavioral disorder are a lack of focus during work or conversation, a tendency to act impulsively etc. The cause of this disorder, especially among kids, was linked primarily to an overexposure to modern gadgets that could drown the child in a flood of (mis)information. A downpour of information, typically from internet, on an untrained, impressionable mind would create havoc with his or her power to concentrate on the task at hand. Very soon, the brightest kids would turn to become the most irritable and finicky. This may sound bad, but things have become worse since then. A major problem today is not outside- distraction but self-obsession. Today’s is the selfie generation. These are the times when websites offer you unlimited space to post unlimited photographs of anything and everything at any time. Today, cellphones are sold on the basis of them being optimized for taking selfies in every imaginable pose. This tendency to take your own photograph at every possible opportunity smacks of selfindulgence only. We wish to pin down every moment of our lives assuming we were the greatest celebrity around. We wish to write our own autobiography even before anyone has requested us to even lift a pen. Instead of chanting God’s names ourselves, we wish that people chant our names whole day. Where has this led us to? We have reached the pinnacle of frustration. Every picture of ours that has not received a “Like” or an “Upvote” increases our frustration to another level. We are scared to become redundant! What if people do not know where I am or what I am doing? What if they are not aware of my current location? God prevent such an apocalypse on this world! Is there something wrong with this fascination for pictures of our own selves? The famous painter Rembrandt is known for creating many self-portraits as do many other popular artists. The Bhagavad-gita, too, deals with the issue of self-evaluation at many places (2.13, 2.56, 2.70 and 5.18). Often there are repeated reference to diagnosing, understanding and rectifying ourselves. The mood of such passages, however, is not to become an icon for self-veneration but to become the object for self-scrutiny. Am I living by the highest standards of humanity? Am I creating problems in this world or assisting in reducing problems of this world? Am I concerned about this world or am I becoming a cause of concern for this world? When we are concerned about ourselves in the mood of service to others, such concern uplifts us and others. When we are obsessed about ourselves in the mood of making others serve us, such self-fixation leads to ruination of ourselves and those around us. The first chapter of the Gita highlights self-obsession of two personalities: Dhrtarastra and Duryodhana. Arjuna in the first chapter of the Gita is also infected with a material conception although based on dharmic principles. Dhrtarastra harbored the desire to enjoy royal luxuries by facilitating Duryodhana’s claim to the throne. His blindness percolated deep into his spirit. He couldn’t complain of inadequate facilities to develop spiritual vision. Physical blindness, instead of affecting adversely, has empowered many saints like Bilvamangala Thakura and Surdas to develop greater devotionto Krishna . Duryodhana followed his father ably. He plotted various schemes to ensure that the Pandavas lost their wealth and kingdom and even tried to kill them in various ways. All this was done with a singular aim of ruling over the throne of Hastinapura. Nothing could stand in the way of his ambitions. In BG 1.3, Duryodhana informs Drona that the opposite army is led by his own disciple Drstadyumna, the son of his arch-enemy Drupada. Dronacarya and Drupada, although friends initially had developed deep enmity with each other and Drupada procured his son Dhrstadyumna from a yajna just to seek revenge against Drona. This Dhrstadyumna was sent to Drona for military training and as a liberal brahmana Drona even imparted him full training. Duryodhana refers to this incident and wants to point out to his teacher his mistake in training Dhrstadyumna . Instead of submitting to his teacher, Duryodhana diplomatically tries to manipulate his own teacher Dronacaryaand tries to incite his anger by referring to this previous incident and attempts to make him fight better against the Pandavas. Also in BG 1.10, Duryodhana’s self-obsession surfaces also when he unknowingly ends up describing the Pandava army as being protected by Bhima. Actually the army is protected by Dhrstadyumna and many other powerful warriors but Duryodhana has been obsessed with killing Bhima since his childhood years considering him as a worthy rival and this negative meditation on his enemy surfaces to his tongue unknowingly.Arjuna, before the war began, gave various fancy reasons for not fighting the war. Unfortunately, all these reasons although dharmic were based on materialistic conceptions and extended self-enjoyment which included his relatives, society etc. In contrast to Dhrtarastra and Duryodhana, Pariksit, from the same Kuru family, exemplified dutiful attachment and purposeful detachment to the throne. He was ready to punish Kali when he ruled from his throne, and quit the throne instantly for perfecting his life in spiritual realization soon after he was cursed to die. A strong contrast between self-obsession and selfsacrifice is depicted in the Ramayana during the battle of Ravana and Jatayu. People obsessed with their own selves can go to great lengths to extract adoration or pleasure for themselves. Self-indulgence reached its summit in the life of Ravana leading to not just his own destruction but also the destruction of his entire dynasty. He sacrificed anyone and everyone in the fire of personal gratification. Jatayu, on the other hand,sacrificed his life in the service of the Supreme Lord and received eternal fame. When we read the Gita, we get a deeper look at ourselves from a spiritual perspective. It reveals to us whether we are beautiful or ugly by spiritual standards. It assists us in taking a selfie not of the face or the body, but of our true spirit or intentions. Whereas a typical selfie traps us in self-obsession, a spiritual selfie using the Gita propels us forward in spiritual elevation. 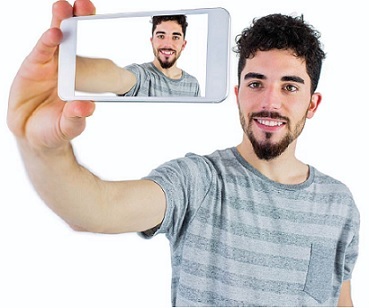 People today are commonly seen using their selfie-optimized phones to click selfies. The Bhagavad-gita also allows people to get another look at themselves. From this perspective, we might compare the Bhagavad gita to a (spiritual) selfie-optimized phone. Nanda Dulal Dasa is a member of BTG India editorial team.